The three founding organisations of the CHS, raised awareness and responded to participants' questions about the Core Humanitarian Standard and the Quality Compass, of which a revised version was recently published by Groupe URD. They also explained how these tools complements the Sphere standards and announced the future publication of a revised version of the Sphere Handbook, which will incorporate the Core Humanitarian Standard in order to further mainstraim it. Numerous organisations approached our information desk in order to inform us that they are applying the Standard in order to enhance the accountability and quality of their humanitarian or development work. The CHS can be applied in a collective context, e.g. when assessing the accountability and quality of the humanitarian services delivered to affected people and communities in the aftermath of a particular disaster or in a specific country; the CHS Alliance has recently embarked on a project with Ground Truth Solutions in Chad, supporting the Clusters in integrating the CHS into the Humanitarian Need Overviews (HNO) and the Humanitarian Response Plan (HRP). Continue testing the application of the CHS in different situations. 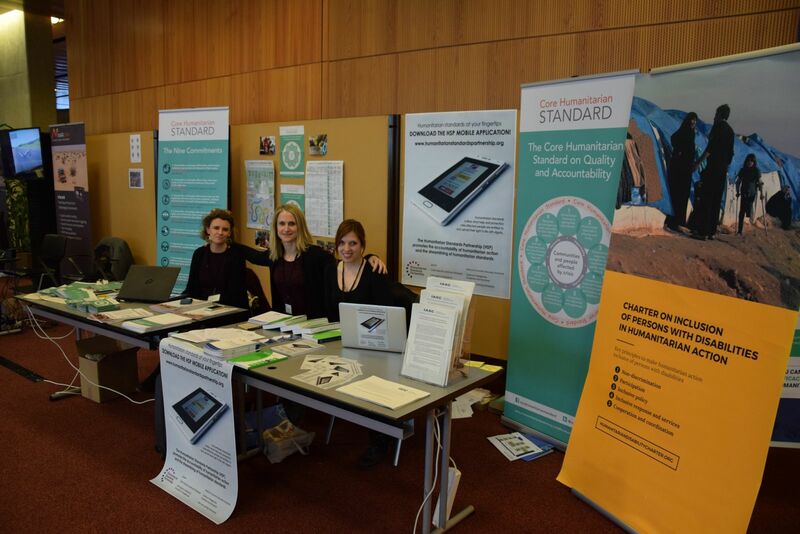 Alongside the information desk about the Core Humanitarian Standards, HelpAge and Handicap International presented their newly published the Humanitarian Inclusion Standards for Older People and People with Disabilities. The Humanitarian Networks and Partnerships Week (HNPW), co-chaired by OCHA and the UK’s Department for International Development (DFID), is an annual event held in Geneva in the first week of February. Since 2015, this event provides a unique forum for humanitarian networks and partnerships to meet and address key humanitarian issues. Networks and Partnerships hold their annual meetings during the week, and work together to find ways to solve common problems. HNPW convenes a large number of participants from diverse groups, including the UN, NGOs, Member States, the Private Sector, the military, academia and others.